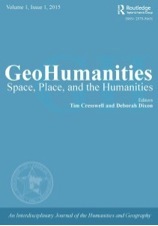 MICHAEL DEAR (DCRP) is pleased to introduce GeoHumanities, a new journal being launched by the Association of American Geographers and published by Taylor and Francis. Its editors are Tim Cresswell (Northeastern University, Boston) and Deborah Dixon (University of Glasgow, Scotland). GeoHumanities publishes original peer-reviewed articles that span conceptual and methodological debates in environmental design, geography and the humanities; critical reflections on analog and digital artistic productions; and new scholarly interactions occurring at the intersections of geography, environmental design, and multiple humanities disciplines. The first issue will be published in October of this year. The journal is likely to be of particular relevance to faculty and students interested in Berkeley’s Global Urban Humanities project (GLOUH) and in the Digital Humanities. As a member of the founding editorial board, Michael would like to draw your attention to the Call for Papers.